Sun., 8 Sep. - Fri., 20 Sep. Sun., 9 Jun. - Mon., 17 Jun. Mon., 26 Aug. - Mon., 23 Sep. Sun., 9 Jun. - Thu., 20 Jun. Sat., 8 Jun. - Mon., 17 Jun. Wed., 4 Sep. - Mon., 16 Sep. Tue., 14 May - Tue., 11 Jun. Wed., 19 Feb. - Tue., 25 Feb.
Wed., 4 Sep. - Tue., 17 Sep. Sun., 9 Jun. - Tue., 18 Jun. Thu., 5 Sep. - Wed., 18 Sep. Sat., 13 Jul. - Sun., 21 Jul. Wed., 9 Oct. - Fri., 18 Oct. 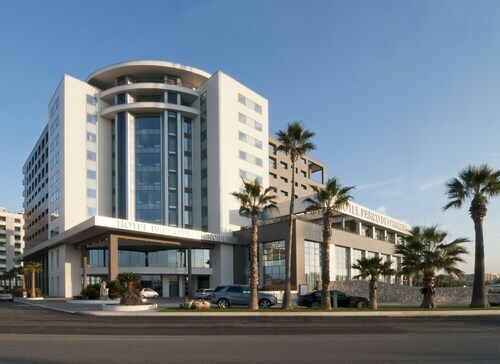 Located in Municipio 5, this spa hotel is 0.8 mi (1.2 km) from Planetarium of Bari and within 6 mi (10 km) of Piazza Giuseppe Garibaldi and Angevin Tower. Bitonto Cathedreal and Provincial Archaeological Museum are also within 6 mi (10 km). Located in Municipio 5, this bed & breakfast is 0.6 mi (0.9 km) from Planetarium of Bari and within 6 mi (10 km) of Piazza Giuseppe Garibaldi and Angevin Tower. Bitonto Cathedreal and Provincial Archaeological Museum are also within 6 mi (10 km). Located in Municipio 5, this hotel is 2.8 mi (4.5 km) from Planetarium of Bari and within 6 mi (10 km) of Lido San Francesco and Fiera del Levante. Bari Harbor and Bari Cathedral are also within 9 mi (15 km). Bari Palese Macchie Station is 10 minutes by foot and Bari Santo Spirito Station is 25 minutes. Located in Municipio 5, this townhouse accommodation is 2.9 mi (4.6 km) from Planetarium of Bari and within 6 mi (10 km) of Lido San Francesco and Angevin Tower. Bari Harbor and Bari Cathedral are also within 9 mi (15 km). Bari Palese Macchie Station is 10 minutes by foot and Bari Santo Spirito Station is 26 minutes. Located in Municipio 5, this bed & breakfast is 2.6 mi (4.2 km) from Planetarium of Bari and within 6 mi (10 km) of Lido San Francesco and Stadio della Vittoria. Bari Harbor and Bari Cathedral are also within 9 mi (15 km). Bari Palese Macchie Station is only a 3-minute walk. 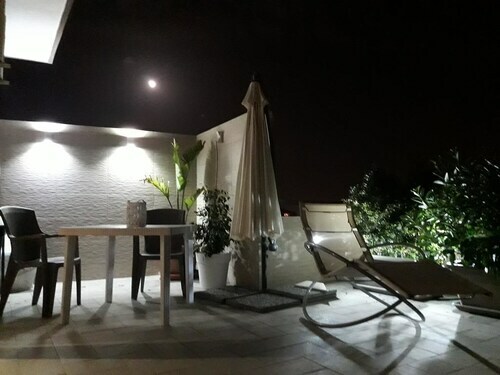 Located in Municipio 5, this bed & breakfast is 2.5 mi (4.1 km) from Planetarium of Bari and within 6 mi (10 km) of Lido San Francesco and Fiera del Levante. Bari Harbor and Bari Cathedral are also within 9 mi (15 km). Bari Palese Macchie Station is only a 2-minute walk. 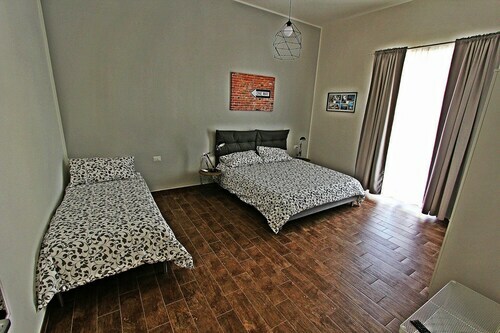 Located in Municipio 5, this bed & breakfast is 1.7 mi (2.7 km) from Planetarium of Bari and within 6 mi (10 km) of Lido San Francesco and Fiera del Levante. Bari Harbor and Bari Cathedral are also within 9 mi (15 km). Bari Palese Macchie Station is 19 minutes by foot. 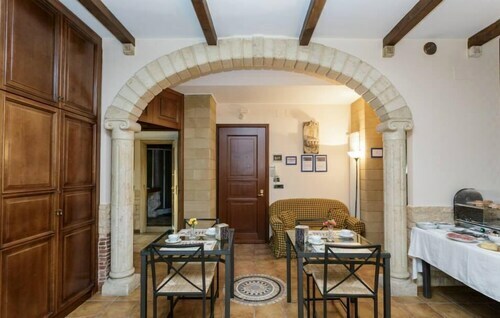 Located in Municipio 5, this bed & breakfast is within 6 mi (10 km) of Lido San Francesco, Bari Harbor, and Bari Cathedral. Fiera del Levante and Stadio della Vittoria are also within 6 mi (10 km). Question : What is the cheapest airline flying from Toronto to Bari? Answer : WestJet is the leader in keeping costs down for their passengers over the next three months. Bookings are being made at just $941 and, when compared to the more expensive bookings of $4,693, it's a terrific bargain. Question : How much is a plane ticket to Bari (BRI) from Toronto (YYZ)? Answer : Cost can range anywhere from $941 to $4,693, prices for YYZ to BRI do fluctuate much more than most routes from Canada. However, usually the sooner you book, the better the price. Answer : The cheapest day to fly from Toronto to Bari is on Monday. If you would like to save some money on your next business trip look for flights on Monday. Answer : You sure can adjust your departure or arrival date and you may save yourself some money by doing it. The cheapest day to fly in May is Monday. Question : What airports do you fly into for Bari? Answer : Departing from Pearson International Airport is not the only way to get to Palese Airport. Try searching for flights from Billy Bishop Toronto City Airport (YTZ). Over the upcoming two months, flights from YTZ to BRI are being priced 72% cheaper than flights from YYZ to BRI. Being just 11 miles away from YYZ, it's easily accessible for most. Question : What is the cheapest date to fly to Bari? Answer : As of Apr 22nd, the cheapest day to fly from Toronto to Bari is Apr 30th. Tickets are currently $1,004, 54% less than the average price.